Three LC environmental studies majors received scholarships to attend the Arctic National Wildlife Refuge 50th Anniversary Symposium held in January at the U.S. Fish and Wildlife Service National Conservation Training Center in Shepherdstown, W.Va. The three-day symposium, attended by about 150 people, featured conservation historians and conservation leaders. Keynotes were given by former President Jimmy Carter, who expanded the 9-million-acre refuge in northeastern Alaska to 19.6 million acres in 1980 as part of the landmark Alaska National Interest Lands Conservation Act, and Dr. George Schaller, globetrotting field biologist whose research on mountain gorillas, giant pandas, and large cats has taken him from the Tibetan Plateau to the depths of the Amazonian rainforest. In his two months in the Arctic wilderness, Schaller recorded 86 species of birds and 23 species of spiders. 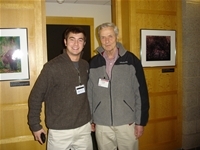 “When I received the email relating to the Arctic National Wildlife Refuge 50th Anniversary Symposium, I immediately knew I had to go,” said Deane Flickinger, LC senior from Mechanicsville, Va. (pictured below with Dr. Schaller). “The fact that there were scholarships given to only a handful of students by the U.S. Fish and Wildlife Service National Conservation Training Center made the opportunity even greater. Other speakers included Thomas Strickland, assistant secretary of the interior for fish and wildlife and parks; noted Rice University historian Dr. Douglas Brinkley (whose latest book, The Quiet World/Saving Alaska’s Wilderness Kingdom, 1879-1960, debuted at the NCTC conference); and Lynn Greenwalt, former director of the Fish and Wildlife Service, under whose tenure the 1980 expansion of protected areas in Alaska took place.